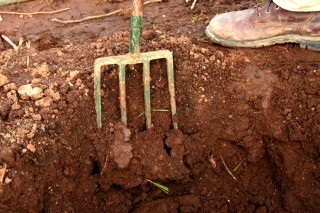 Dig a hole and position root ball level with grade line. NEVER place root ball under grade level. Insert 3″ perforated drain tile between the side of root mass and the side of the hole until it touches the bottom of the hole. Back fill the area around the root ball with a mixture of plant starter or compost and existing soil (1/2″ clumps or smaller). Cover top of root mass with mulch and cut drain tile flush with grade level.